The victim's in a fiery crash on Highway 231 South (Shelbyville Highway) have been identified. Sgt. Charlie Caplinger with the Tennessee Highway Patrol tells NewsRadio WGNS 39-year old Carey Coleman of Bell Buckle and 56-year old Robin Ross of Murfreesboro passed away as a result of injuries sustained in the crash, which happened around 3:30 Tuesday morning. Preliminary reports from THP investigators indicate Coleman's vehicle, traveling southbound, crossed the median and struck Ross northbound vehicle head-on. Coleman was driving a 2000 Dodge Ram while Ross was in a 2008 Toyota Sienna. Both vehicles caught fire. Both Coleman and Ross died due to the extent of their injuries. There were no passengers in either vehicle. Both were taken to the medical examiner's office for autopsy. While it was not reported whether seat belt usage would have made a difference in the crash, Coleman was not wearing a seat belt. Ross was wearing a seat belt. Shelbyville Highway at Oak Meadows Drive was shut down for approximately six hours while the THP conducted their investigation. A fiery crash has claimed at least two lives on Highway 231 South about a mile and a half past Joe B. Jackson Parkway. The wreck happened near the MT Bottle bar on Shelbyville Highway / or 231 South early at Oak Meadows Drive Tuesday morning around 3:30. Sgt. 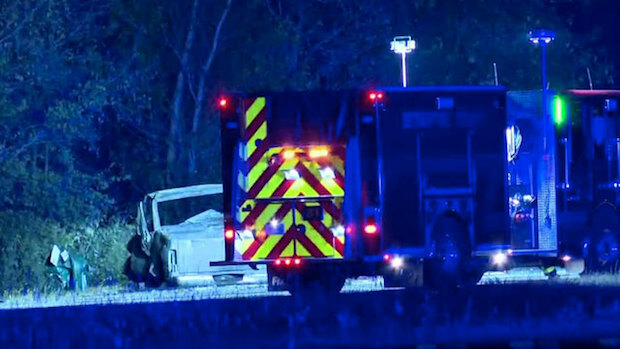 Charlie Caplinger with the Tennessee Highway Patrol confirmed with NewsRadio WGNS the crash involved two vehicles and the drivers of both were deceased. Shelbyville Highway was shut down much of the morning drive while the THP's Critical Incident Response Team investigated the crash scene. The roadway fully re-opened around 9:30am.